I am always present before all yogis who keep their samaya and gain realization. To view the consecration filmed by Doug Beechwood of Spiral Media on March 22, 2014, at the Dorje Yudronma shrine, please CLICK HERE! Please CLICK this link to view Photo Album #1 of the consecration by Tulku Sangnag Rinpoche of the Dorje Yudronma shrine in March 2014!And please CLICK this link to view Photo Album #2, which contains a photographic log of the consecration events from beginning to end! 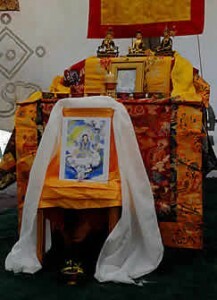 These two photos below show Dorje Yudronma when initially installed in 2010. “When I was in Tashi Jong, at around the age of 20, I did a three-month retreat under the guidance of Tokden Amtrin. One night I had a very clear dream—I was walking toward a hillside, following a lady who appeared to be in her mid-30s, wearing traditional Tibetan dress. It seemed like there was a connection between us, like she had something to say to me or give to me. Yet if I walked faster to catch up to her, she walked faster; if I slowed down, she slowed her pace as well. This kept on for some time. At some point, we came to a slight bend in the road up a hill, where she stopped, and from the pocket of her dress pulled out a brilliant turquoise mirror. She laid it on the ground underneath a pile of dust and leaves, and pointed to it, indicating that the mirror was for me, and I should pick it up. Then she walked quickly on ahead, glancing back from time to time. I reached the spot where she’d left the mirror, and just as I was bending to pick it up, I suddenly woke up with a feeling of great warmth and joy. 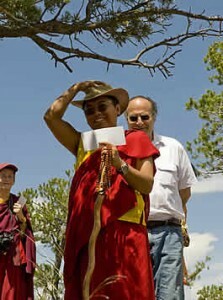 Dharma lineages in Tibet often have specific Dharma protectors associated with them. 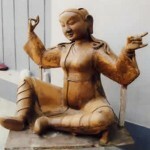 Dorje Yudronma is a wisdom deity that manifests out of her compassion in the form of a protectress. 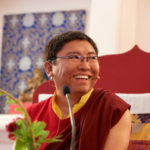 Tsoknyi Rinpoche has a special connection with her and asked her to reside on Yeshe Rangsal and help his students clear obstacles and progress on the path. There is a beautiful site on the land to honor her, close to the stupa. A meandering path from the Stupa leads to the Shrine, which initially began as a photo of the protectress with a brief supplication prayer and an offering bowl. Now, thanks to many donors, a permanent shrine to Dorje Yudronma has been completed and consecrated, a place where students, retreatants and the public can come to make prayers, offerings, and practice. Here is a photo of the nearly completed Shrine in September 2008. The site now has a footpath for circumambulating and native landscaping. For more about the Dorje Yudronma shrine, please click here. During the Crestone 2008 August retreats, Rinpoche performed a moving blessing ceremony and dedication for the Dorje Yudronma shrine. Participants walked a short path on pilgrimage from the teaching tent to the location of the future shrine, where they offered flowers and prayers. Accompanied by her retinue, the unceasing expression of awareness. We supplicate and make offerings. Accomplish our desires as wished. 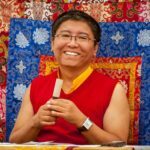 Learn how you can help to further support rinpoche’s projects.